In this review we feature the best Skullcandy headphones that deliver the best sound performance and comfort for audiophiles and bass lovers. Skullcandy headphones are known for some of their deepest bass, crisp highs and clean audio performance, and are great for electronic dance music, rock and pop lovers. Our experts have tested these Skullcandy headphones to determine which ones provide the best value for money and long-lasting listening experience. These headphones are designed with proprietary acoustic drivers that can delivers stunning lows that can make your head spin. Furthermore, these headphones are well-built and durable for a comfortable listening experience. If you are looking for the best Skullcandy headphones for music, be sure to check out our top picks below! 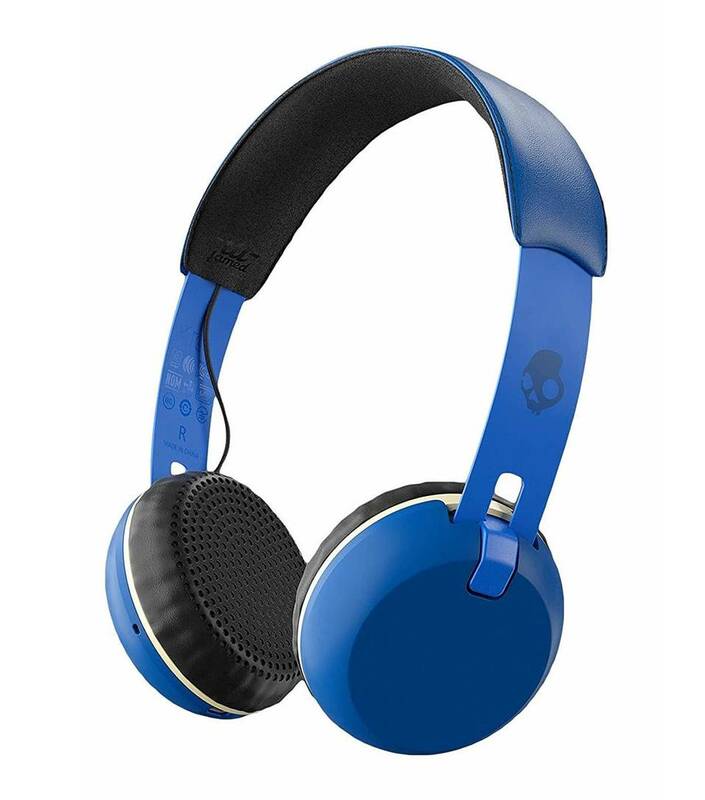 The Skullcandy Crushers are Bluetooth wireless over-ear headphones that deliver high-quality audio. They utilize two full range custom tuned 40mm audio drivers and two additional subwoofer drivers that work together to deliver crystal clear sound performance with powerful bass. The adjustable haptic bass levels allow the listener to fine tune the bass experience to find the balance he prefers. They feature passive noise isolation with sealed earcups that block out distractions and exterior noise, and they cover the whole audible frequency spectrum (20 Hz – 20 kHz). The sound performance of the Skullcandy Crusher headphones is crystal clear with deep bass response – the bass is incredibly deep and powerful and feels punchy on all sides. Watching movies and listening to music on these headphones feels as though you are listening to a built-in subwoofer at the side of your ears. That being said, the bass stays where it should be as bass without muddying into the midrange frequencies. The headphones feature Bluetooth functionality and up to 40 hours of rechargeable battery life allow you to take the headphones on the go. Their rapid charge functionality offers up to 3 hours of listening with just 10 minutes of charging and a full charge at 2.5 hours of charging. A built-in microphone and on-ear buttons allow you to answer and end calls, change tracks, and adjust volume directly from the ear cups, without the need to take the phone out of your pocket. They fit snugly on the head and they are comfortable for long hours of listening. In addition to that, the ear pads of the Skullcandy Crusher feature memory foam for maximum comfort. The Skullcandy Hesh 3 are Bluetooth wireless over-ear headphones with a microphone that deliver high-quality audio performance. They feature an integrated analog amplifier that pushes a pair of high-quality 40 mm audio drivers that produce great volume output and a wide dynamic range.The Skullcandy Hesh 3 are easy to use and to set up, featuring voice notifications assist in pairing your device. They also allow you to take calls, change tracks, and adjust volume with the built-in easy-to-use controls and microphone. 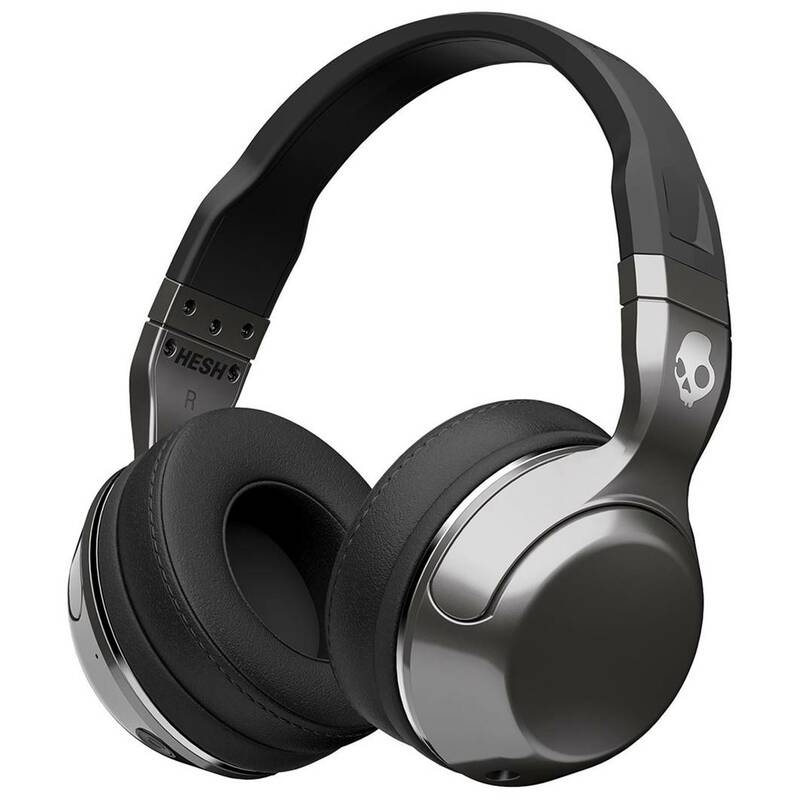 The sound quality of the Skullcandy Hesh 3 is superb, with crisp highs, detailed midranges and great bass performance. The 40mm audio drivers provide rich and dynamic sound quality across music genres, and electronic dance music and rock sounded especially good. We liked the crystal clear sound performance and bass output from the Hesh 3 headphones. The Skullcandy Hesh 3 headphones have up to 22 hours of battery life with a single charge, and with the help of their rapid charge technology, you can get several hours of use out of a 15 minute charge. They are very easy to carry wherever you go as they feature foldable design, memory foam ear cushions as well as a padded band at the top that make them both comfortable and very portable. Their design is sleek and modern looking and they come in plain black color. The package includes both a charge cable and 3.5 mm aux cable. You can use the latter when the battery is off to keep the headphones running and the microphone will also work in this case. The SkullCandy Uproar are on-ear wireless headphones that deliver premium sound quality while being comfortable on the ears. They deliver crisp and clear sound that is suitable for listening to any kind of music. Their Bluetooth functionality makes it possible to take your music wherever you go without any unwanted cord tangling.Thanks to the synthetic leather ear pillows they are soft on the ears. Their low-profile and lightweight design makes it easy to wear them for long listening sessions. They feature long lasting battery that lasts for a full 10 hours with a single charge, making them very portable. The sound quality from the Skullcandy Uproar is clean and crisp, with great attention to detail and pretty good separation. The amount of bass these headphones produce is decent although not overwhelming like the Skullcandy crushers. These headphones are primarily designed with a low-profile design which makes them easy and lightweight to wear. They are great for casual listening on the go. In addition, the Skullcandy Uproar comes with a built-in battery that fully recharges in 2.5 hours. They allow you to take calls and navigate your playlists with the built in microphone and easy-to-access buttons on the ear cup, without the need to take the phone out of yout pocket. You can use the plus and minus buttons to adjust volume, change songs and hit the circle button to answer and end calls or play and pause the music. The materials used ensure sturdy build quality and durability while their design is sleek and modern looking. If you are looking for a set of portable and compact Skullcandy headphones, we highly recommend the Skullcandy Uproar. 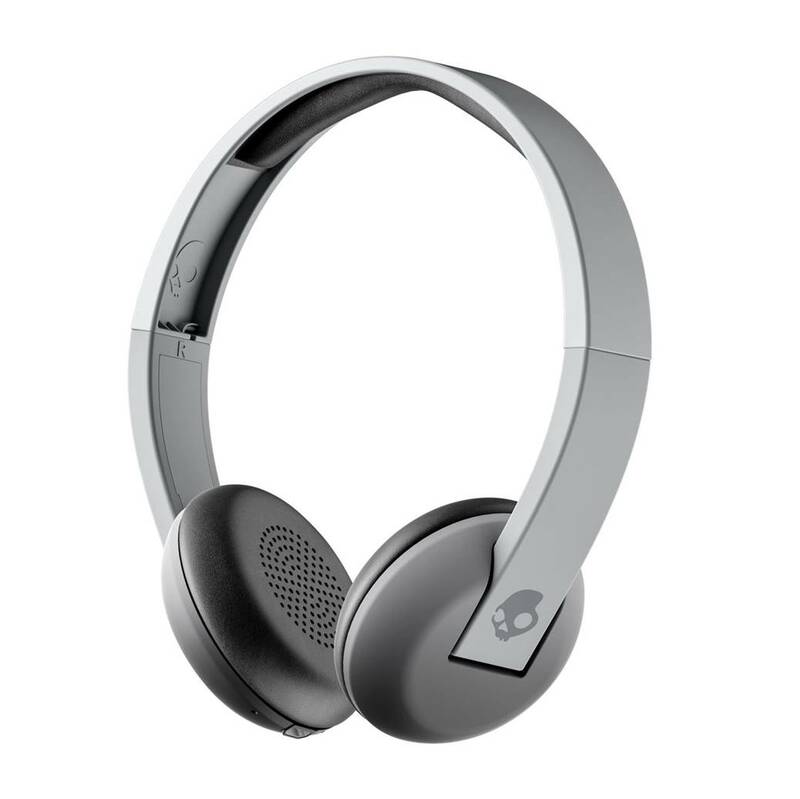 The Skullcandy Hesh 2 are Bluetooth wireless over-ear headphones that deliver high quality sound. Their sound technology delivers powerful bass, crisp mids, warm, natural vocals and precision high frequencies. They feature soft synthetic leather ear cushions that provide comfort for long listening sessions. The flexible headband features a metal understructure that adds to durability, a feature that many user reviews have mentioned. Their over-ear design provides passive noise isolation that enables listening to music in lower listening volume. The sound quality from the Hesh 2 headphones is surprisingly good, with great bass, warm and natural vocals and crisp highs. Music genres such as electronic dance music, rock and hip-hop sounded vibrant and well-defined, and the bass adds a layer of depth and complexity to music performances. The wireless streaming works like a charm and we did not experience any lip-sync issues while listening to music or watching movies on the headphone. The Skullcandy Hesh 2 comes with a built-in rechargeable battery that provides up to 15 hours of music when fully charged and it fully recharges in 2.5 hours. Behind the left ear cup is a micro USB port for charging and an LED indicator will blink red when the battery is at 10%. You can stream your music from any Bluetooth enabled device and the on-board plus and minus buttons let you adjust the volume and choose songs without the need to take your device out of yout bag or pocket. You can also answer and place calls on hold with the round power button. The package also includes a soft case (pouch) as well as an AUX cord for use directly with your audio device in case you run out of battery. The Skullcandy Riff are high-quality, Bluetooth wireless on-ear headphones with a built-in microphone that are made for everyday use without any unnecessary extras. They deliver premium audio quality across the whole frequency spectrum and they provide enough volume output for most occasions. They feature wireless Bluetooth connectivity that is easy to set up and pair with your device. The built-in microphone allows you take hands-free calls without any audible noise. 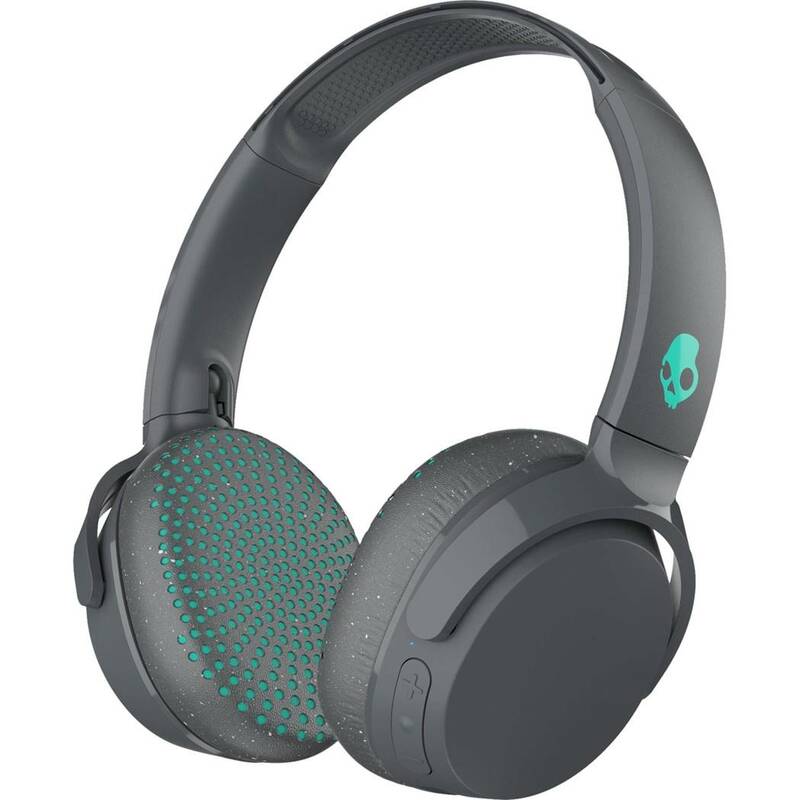 They have lightweight design and it is possible to fold them to fit in a briefcase or a bag and such features make the Skullcandy Riff very portable. The sound quality of the Skullcandy Riff is crisp and clear, with vibrant midrange tones and crystal clear audio performance. The bass on these headphones hits hard and punches pretty deep. We liked the fact that you can crank up the volume on the Skullcandy Riff headphones without hearing any distortion, which is a great added plus. 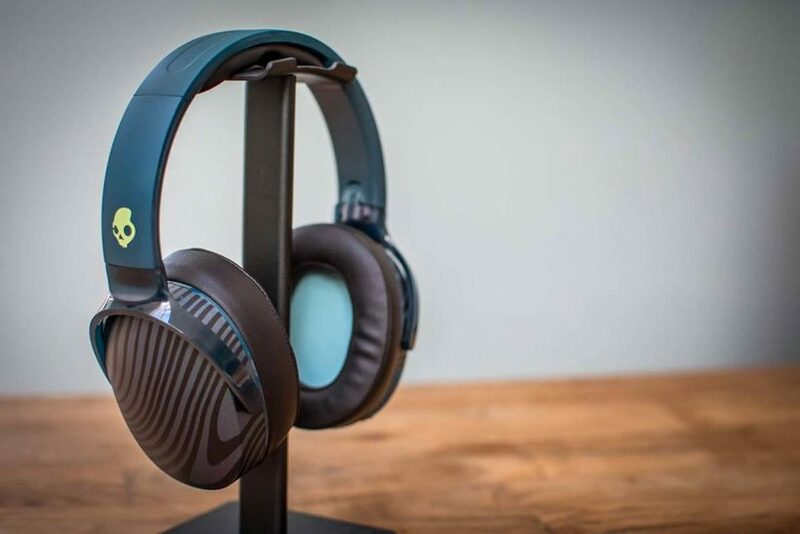 The design of the Skullcandy Riff headphones is sleek and modern-looking while the materials that have been used especially on the headband add to durability. They come in four different colors, featuring a soft-touch finish, and plush ear cushions. Coming with Rapid Charge technology, they need 10 minutes of charging to give you 2 hours of use. Their buttons are convenient and easy to use, allowing you to adjust the volume, change tracks and even activate your personal assistant to get directions or send hands-free texts. Overall, the Skullcandy Riff are highly recommended to those looking for high-quality headphones for everyday, on-the-go use. 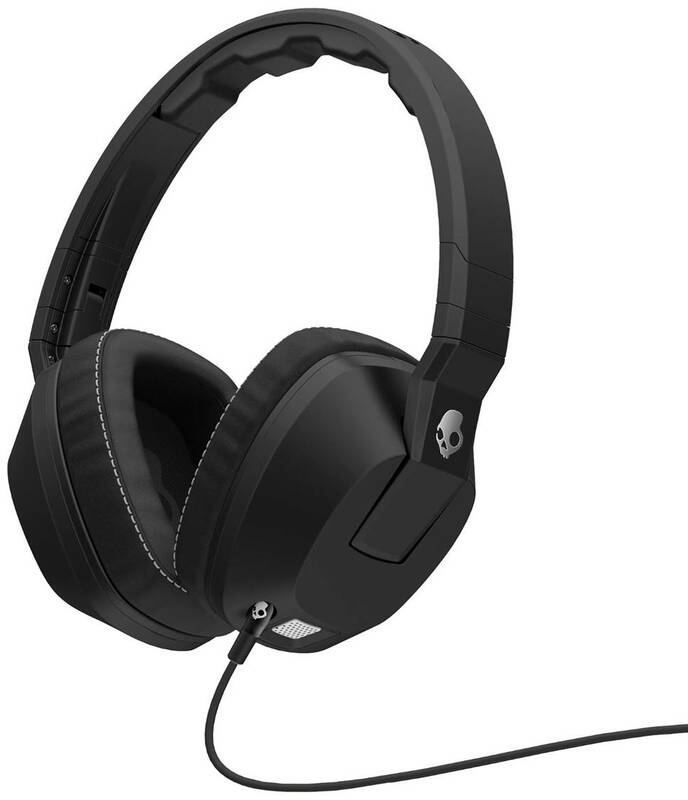 The Skullcandy Crusher are high-quality headphones with a built-in amplifier and microphone. They deliver crisp and clear sound performance through the REX40 driver that delivers very smooth frequency response along the whole spectrum with minimal distortion. Regarding the low end, they feature the Sensation55 driver which is Skullcandy’s patent-pending bass extension driver. Through this driver, the Crusher delivers thumping and realistic bass experience and in addition to that, the bass is adjustable: they come with a sensation slider on the left ear cup that allows you to adjust the sensation levels to your preference or music. In terms of sound quality, the Skullcandy Crusher nails it with crystal clear highs, crisp midranges and very deep bass performance. It has a built-in amplifier that allows you to lower the bass response to incredibly low levels; the volume output is very good without any distortion at maximum volumes. We also liked the adjustable bass controls located on the left ear cup which allow you to adjust the bass output levels depending on your preferences. At its maximum setting, the bass output is deep enough to deliver thumping sound that can rattle your head. The Skullcandy Crusher headphones feature specially designed acoustical porting within the construction of the ear cup that allows both drivers to move freely, increasing the bass and reducing distortion. They are also equipped with a built-in amplifier that is hidden in the ear cup and works with a single AA battery that lasts for up to 40 hours of playback. The amp powers off automatically within 10 seconds when your music stops or the headphone is unplugged from a source during playback. The Skullcandy Crusher headphones come with wired connectivity technology. They feature foldable and ergonomic design that ensures both portability and comfort. 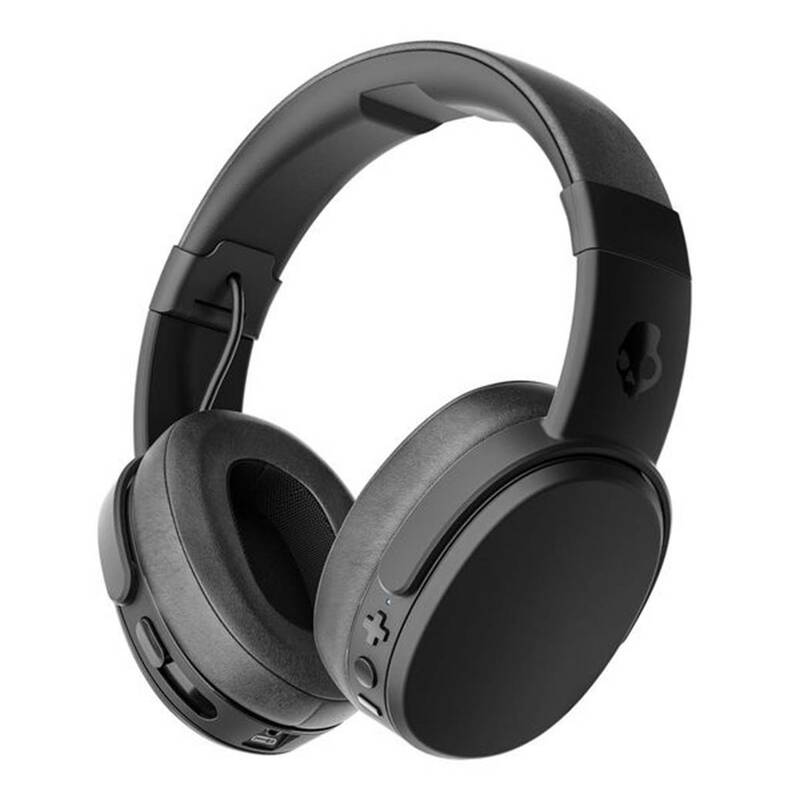 The Skullcandy Venue are over-the-ear, wireless, active noise cancelling headphones that deliver high-fidelity sound with many useful features. The Bluetooth connectivity allows you to take them wherever you go without having to worry about tangling any cords. The active noise cancelling function filters out unwanted noise and makes them suitable for listening to music while you commute. The Skullcandy Venue also feature built-in Tile technology so you can track your headphones anywhere. In terms of sound quality, the Skullcandy Venue delivers crystal clear vocal clarity with nice highs and detailed midranges. The bass output is strong and punchy, and is further enhanced when the active noise cancellation is turned on. We did not hear any hissing noise while the noise cancellation is turned on, and is great for listening to music on busy streets or on the airplane. The battery life on the Skullcandy Venue headphones lasts up to 24 hours with a single charge and they are equipped with Rapid Charge technology: 10 minutes of charging gives you 5 hours of battery life. These headphones also come with monitor mode that allows you to press a button to communicate with the world around you without the need to take your headphones off. You can also use Venue to activate your device’s voice assistant, Siri, Google Assistant, Cortana, and more with the quick touch of a button. The headphones are compatible with iPhone XS, Samsung Galaxy, and all Apple and Android Bluetooth enabled devices. 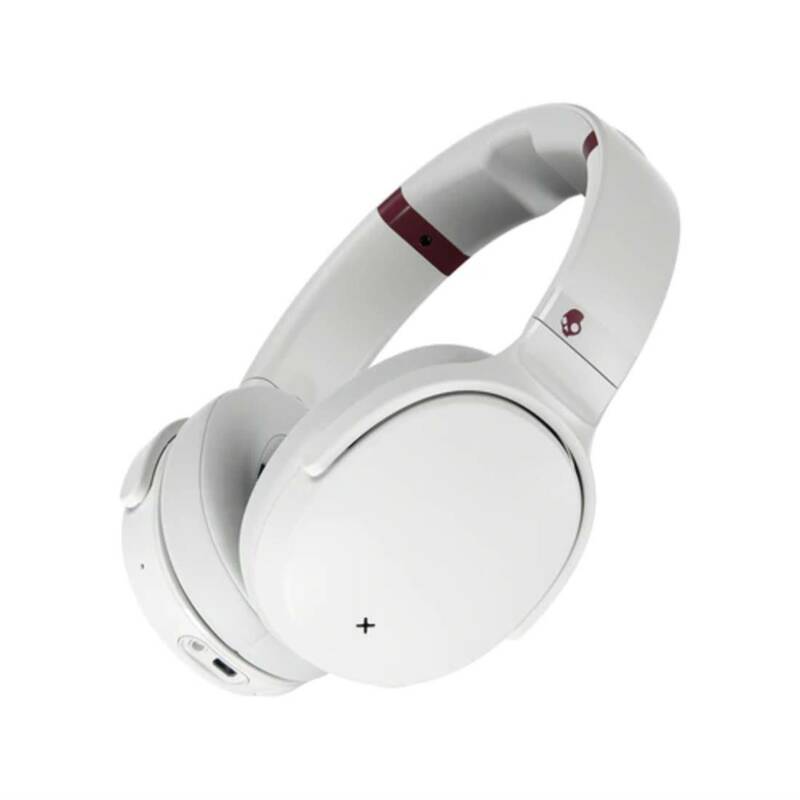 These headphones come in white/crimson color and feature sleek and modern-looking design. Their lightweight and premium-quality materials ensure comfort, robust build quality as well as durability. The Skullcandy Grind are Bluetooth wireless on-ear headphones with built-In mic and remote that have been made with portability in mind. They deliver high-fidelity audio experience, featuring 40 mm audio drivers tuned with Skullcandy’s Supreme Sound that make them suitable for listening to all kinds of music. The long battery life that lasts for up to 12 hours with a single charge, combined with the wire-free Bluetooth connectivity let you take these headphones wherever you go. The Skullcandy Grind headphones provide crystal clear music clarity with wireless freedom. Music soundtracks feel crystal clear and vibrant, with nice highs and decent midranges. The bass feels punchy although not as tight as the Skullcandy Crushers. That being said, these headphones do have great sound considering their small and compact size. The Skullcandy Grind headphones provide comfort for long listening sessions as well as durability thanks to their high quality materials such as the solid metal headband and plush on-ear pillows. The built-in controls are located in the ear cup and they are really easy to use, allowing the listener to play and pause music, answer and end calls, skip tracks and adjust volume with just three buttons. They come in light blue color and feature sleek and modern looking design that makes them really stand out. The package includes a back-up aux cable with a built-in microphone and a remote in order for you to continue using your headphones if the battery dies. The battery fully recharges in 2.5 hours. 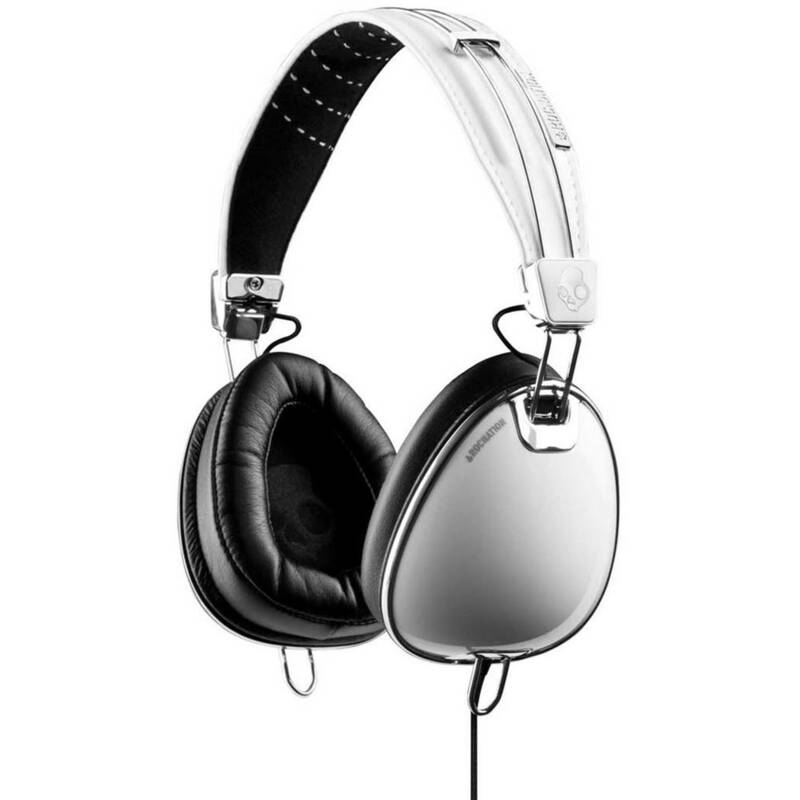 The Skullcandy Aviator headphones are premium quality headphones that are sleek and modern looking. They feature an optics inspired design, especially on the custom styled drivers, that makes them quite stylish and beautiful. They are comfortable to wear for long hours as they have soft leather touch memory foam ear pillows. They deliver crisp and detailed sound performance with thumping bass, natural vocals and accurate middle and high frequencies. They are suitable for every music genre but they are particularly god at reproducing jazz, classical and R&B music. 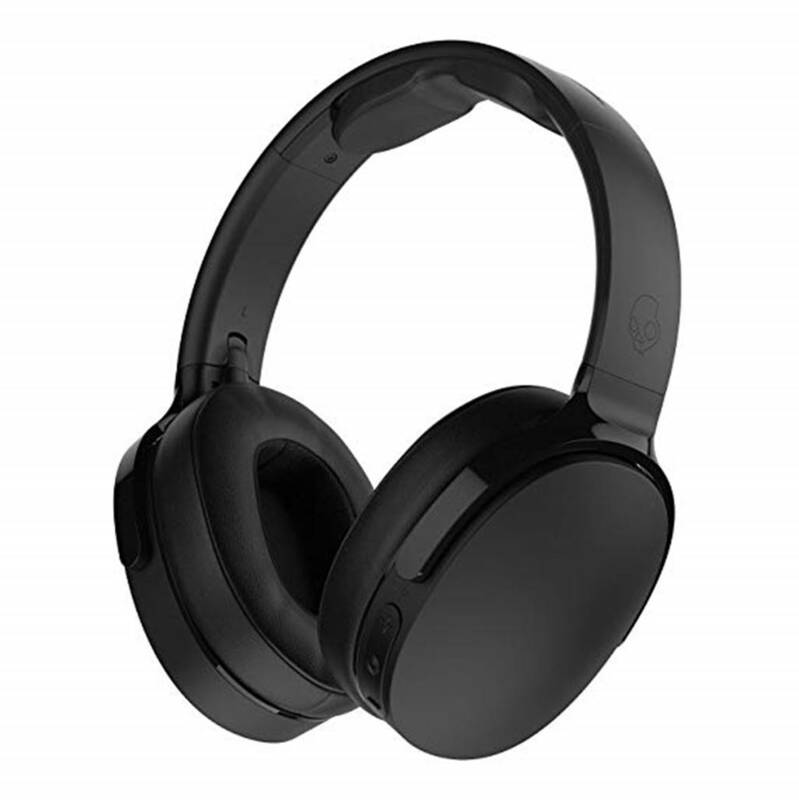 The sound performance of the Skullcandy Aviator is more analytical than the other Skullcandy headphones, with a focus on separation and detailed music performance. The spatial sound reproduction makes these headphones great for classical and instrumental music performances, with crystal clear sound effects. The sound signature of the Aviator headphones is best described as warm and mellow with decent bass performance. The Skullcandy Aviator is constructed from premium quality materials, such as the metal under-structure that has been used for the headband which ensures durability and sturdy build quality. The Aviator headphones come with a stylish travel bag that stores the headphones in safety, and they also feature a detachable cable for better mobility. In order to ensure a comfortable fit, each ear plate has an extender running through its center that allows you adjust the position of the cups by pulling them up or down. A three-button in-line remote with a mic can pick up calls and control your music with play, pause and track functionality, allowing you to take control of your device without the need to take it out of your bag or pocket. The Skullcandy Mix Master Mike are a pair of headphones with DJ Capabilities that have been approved by Beastie Boys DJ Mix Master Mike. They deliver premium quality audio thanks to the Mylar drivers and gold-plated input connections that enhance the sound quality. The sound performance is characterized by attacking bass, natural vocals, and accurate high frequencies. The articulated cup movement drives dual channel cue control so you can hear the true track and the house at the same time. The sound quality on the Skullcandy Mix Master is excellent, and delivers high-fidelity sound performance exactly as the artist intended it to be heard. The sound signature of this headphone is V-shaped, with good emphasis on the highs and lows. The bass output from the Mix Master is decent by default, but can be adjusted by pairing with a portable headphone amp. One of the unique features of this pair of headphones is the ambidextrous audio inputs that allow your cable to go both ways. Additionally, a durable coil cable is included for professional DJ and studio gigs, while the Skullcandy straight cable with Mic3 in-line mic and music control lets you take calls and tune tracks. The 3-panel memory foam ear pillows ensure comfort for long listening sessions. They come in matte Black color and feature minimalist but beautiful and modern design. The high-grade materials that have been used for the Skullcandy Mix Master Mike ensure both robust build quality and durability. 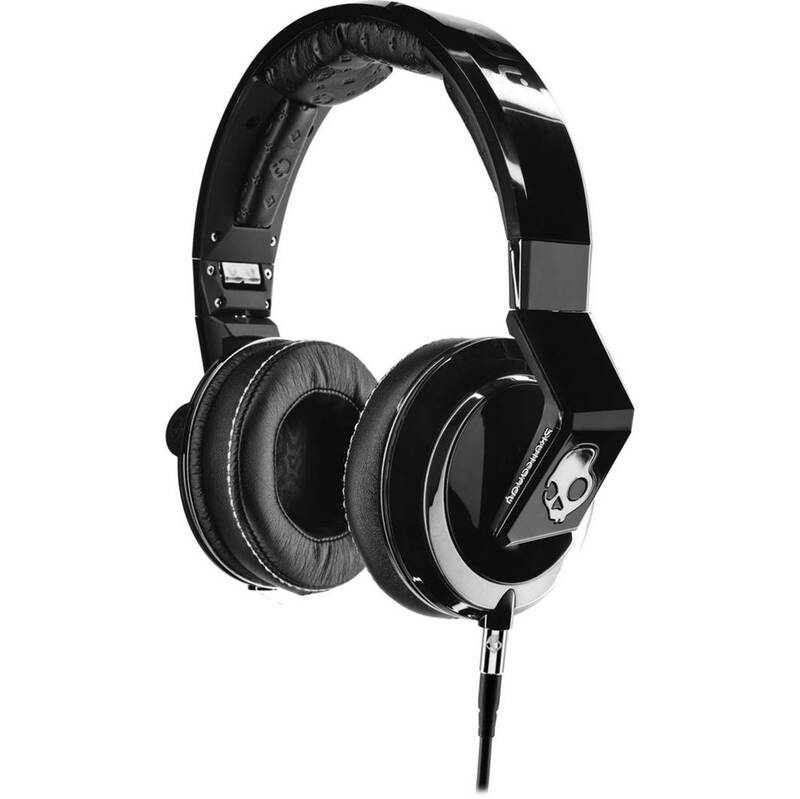 On the whole, the Skullcandy Mix Master Mike headphones are certainly recommended to audiophiles with high standards.